The following interview was published in Issue #21 (Winter/Spring 1998) of “The Barricade” – the international newsletter of Les Misérables. In addition to his work with the stage productions, David Charles Abell also has extensive recording experience. He has served as musical director, musical supervisor and co-producer of numerous Les Mis cast albums, as well as conductor of the Complete Symphonic Recording of Miss Saigon and the original musical director of Martin Guerre. Without audience response and musical staging, a conductor must recreate the atmosphere of a live performance in a recording studio. “The ideal way of recording each track for a cast album is to have all instruments in the orchestra at once so that you get a better performance,” he says. “But if you need to add or change any of the instruments later, you can do so, to some extent. An experienced producer will know what can be fixed during the mixing process and what can’t. “First, the orchestral tracks without singers are recorded, usually in several sessions. Sometimes you have the singers in the recording booth for a guide track, but they generally won’t give their best performances then because the environment is so unfamiliar to them. They are in a booth, they have headphones on, they are trying to watch the conductor, they are not hearing the orchestra and each other as they normally do, so these tracks are generally almost never used for the album. How do the different members of the creative team collaborate during the recording process? “As a musical director,” he says, “you conduct the orchestra during the recording sessions, but you might also be present during the singers’ recording sessions and help them through their numbers if they’re having trouble staying with the track. You may need to draw the emotion out from them. Some singers need that; others don’t. You also go back to the booth between takes, listen to them, and try to determine which aspects could be further improved on the next take. Abell is particularly satisfied with his first cast album, for which he was both musical supervisor and musical director: the 1991 Paris Revival Cast album (TREMA 710369/370). This recording offers vocally stunning performances by Robert Marien, Louise Pitre, Stephanie Martin and Jérome Pradon and brilliantly recreates the atmosphere of a live performance. Abell also served as musical supervisor of the Prague cast recording (BONTON 71 0096-2 311), which he co-produced with Zdenek Merta. There are certain restrictions to the adaptations, however. “If the tune has to have a certain melodic shape, then you have to translate the lyrics to the exact number of syllables that are required,” he says. The US Third National Tour gave Abell a feel for the road show experience and allowed him brief sojourns in many cities across the United States. “It was exciting but also physically and mentally demanding – not to mention the fact that at the end of every week you pack your suitcase and move to a new hotel, and you’re away from family and friends,” Abell says. Abell was born and raised in Winnetka, Illinois. He studied with the acclaimed French composer and conductor Nadia Boulanger at Chicago’s Conservatoire American. 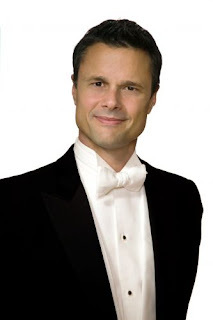 He was one of the youngest conductors to make his American debut with the Washington Opera in 1982, replacing John Mauceri in The Turn of the Screw on 16 hours’ notice. He debuted with the New York City Opera three years later. 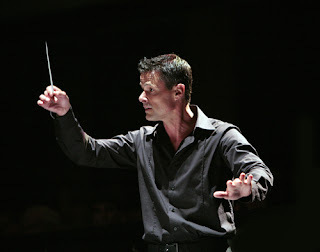 The 38-year-old maestro has worked with many leading figures in classical music, including the late Leonard Bernstein. He assisted the great conductor and composer in A Quiet Place at La Scala and conducted his composition Mass in Berlin. 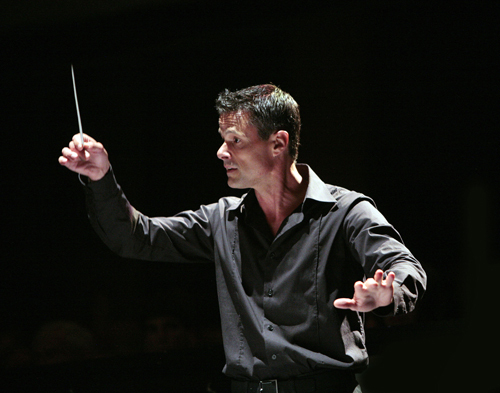 The latter engagement marked Abell’s professional conducting debut. Even a cursory glance at his career highlights confirms that Abell has firmly established himself in the opera world – yet such credentials are hardly surprising, given his educational background and his natural musical talent. Abell graduated from Yale College with a Bachelor of Arts in Music, then earned his Master of Music in Conducting (Orchestral) at Juilliard. He received the prestigious Julius Rudel Award, an accolade bestowed upon a promising young conductor in the New York City Opera, and was nominated for a Dora Mavor Moore Award in 1993 for his musical leadership of Miss Saigon in Toronto. Despite his accomplishments, Abell remains modest and unassuming, preferring to let his musical achievements speak for themselves. He insists in a self-deprecating manner that “as a conductor, you’re only as good as your last performance.” He admits, however, that he has work hard to build a successful career. Abell strongly believes in playing an active part in the creative process and making a significant contribution to each artistic project. This axiom probably explains why he has never taken over from another musical director in any musical and why he has yet to make his West End or Broadway debut in Les Mis. Abell also attributed his success to the contribution of Seann Alderking, his partner for 14 years. Abell and Alderking met at Juilliard. They have worked together in various Les Mis productions, Miss Saigon in Toronto and London’s Martin Guerre. And what effects do Abell’s musical abilities have on his work? “I think David’s interpretive skills have brought a larger sweep to his Les Mis productions, as well as an emotional depth which isn’t always heard in Broadway or West End musicals,” Alderking replies. With the West End production of Martin Guerre winding down at the Prince Edward Theatre and the Tenth Anniversary Concert fading into a distant memory, Abell looks set to soar to even greater heights in his conquest of the opera world. In the hearts of Les Mis enthusiasts, however, he remains the most prominent conductor of the world’s most popular musical.